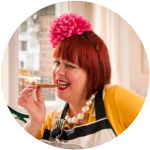 I’m very excited by how many new supperclubs are emerging in the group I created…the Supperclub fan group. We now have 358 members in just a month and there are now more than 40 supperclubs around the country. New ones to watch include the Joginder supperclub in Tufnell park, cooking by a real Indian amma, Dine at my house in the Scottish Borders (they said ‘We aren’t doing fried Mars Bars”, I replied “Why not? I’d travel for that!”), a fish n chip monthly supper in East London (they get up early to buy the fish, details soon) and from places as far away as Austria and Spain. I’ve visited a couple in recent weeks and reviews will be up soon. This is really cool. I love how all these people are coming out of the woodwork. A brilliant idea to start the group – well done.